The 2005 food pyramid released by the United States Government was designed to include the exercise component which had been left out of the original nutrition guidelines. However it received criticism because some critics said that it was more of a tool to market American foodstuffs to the public than a focus on suitable nutrition for all. 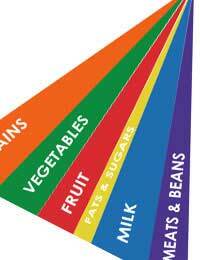 In the average pyramid, the yellow fats and sugars line was extremely narrow and the orange grains line was very wide. The pyramid also showed a series of steps cut into the side of the pyramid, with a cartoon figure running up them to denote healthy exercise. Another key difference in the 2005 food pyramid was that instead of having the general term ‘servings’ it used the American system of cups and ounces. The grains target now became six ounces a day, the vegetable target two and a half cups with two cups of fruit, the healthy eating target for milk was three cups (two for children under the age of twenty-four months) and five and half ounces of meat or beans daily. While many people welcomed this clearer indication of portion sizes, there were criticisms that the meat or beans target was too high and would encourage people to over-eat cholesterol and fat rich meats like steak on a daily basis. While the vegetable target of two and a half cups a day also mentioned dried beans and peas as one of the suitable foods for this ‘line’ causing confusion because beans appear in two different sections of the pyramid. A final complaint was that the narrow yellow line denoting fats and sugars did not appear in the breakdown of servings. This was because the guidelines wanted to suggest that calories coming from such foods should be so few in number. They didn’t feature in dietary planning but it was pointed out that it could be interpreted as saying that any calories coming from sugar and fat were extra to the calorie target for that individual, not a part of it. A special section of the posters distributed to the American public contained information about finding the right balance between exercise and diet. The recommendations were to be physically active for at least 30 minutes a day, or 60 if weight prevention was a goal while 90 minutes exercise a day might be required if weight loss was desired. It was stated that children and teenagers should be active for an hour a day on most days. While many health practitioners welcomed this advice, there was further criticism that there was no clear indication of what was meant by ‘physically active’ or advice about obtaining medical advice before starting to exercise. One key change to the food pyramid that was universally popular was the ability of any individual to get a tailored food pyramid by entering their age, height, gender and exercise level on the mypyramid website. This offers a calorie level guide, suggesting the right calorie intake for that individual and also giving the number of calories on any day that should come from sugars.